Have you become tired of 9th Class Chemistry Notes with Solved Examples PDF the 9th Class Chemistry notes that have solutions of all the examples of your book? Here you will not get the notes in PDF rather you can read online without downloading anything. Chemistry for most of the Pakistani students is difficult, but if you have all the content like notes, videos, and easy articles on the topics, this subject will be a piece of cake. Clearing the concepts is extremely critical, that's why, you should use Youtube where every topic has animation. You know our brain understands a topic well if it has a video. The same when you watch a movie, you know everything of it because of visual presentation. Our brain is a visual lover! The first chapter is all about the basic of Chemistry from the definition of Chemistry to its main branches, from empirical formula to formula mass, from Chemical species to Avogadro's number. The basic concepts of all these topics are extremely important. Make use of Youtube to learn the topics if you don't understand. This chapter is dedicated to Atom. Important questions are taken from cathode rays and its characteristics. And how Proton and Neutron were discovered with the help of discharge tube. Rutherford's experiment is also important and its defects for a short question. Try to clear your concepts about isotopes about hydrogen and carbon with diagrams. This chapter is truly focused on Periodic Table, and its basic understanding. The concepts explained in this chapter are extremely important for exam prospective and when you will enter F.Sc level. Ionization energy, shielding effect and electron affinity are critical and easy to understand. It's a game played between the electron and the neutron. The closer the electron is with neutron, the stronger its attraction is, lesser in size, but has a high value of ionization energy and electron affinity. This chapter is one of the most important chapters for your exams. This chapter is about how an atom mingles with each other in order to be a part of a bond either it is ionic bond or covalent bond. The most interesting question is why an atom forms a chemical bond? Because it wants to be more stable as you study to be a doctor or an engineer or a biologist. Ever person wants to be rich, the same goes for atom too. Physical States of matter are discussed, and its laws. The most important questions are Boyle's Law and Charles's Law. The other critical questions are vapor pressure, evaporation, boiling point, types of solid, and allotropy. This chapter is all about solution. Not that solution to your common problems that you face in your life :). Rather it is about water solution. Saturated and super saturated solutions are the most important questions. Then the concentration units are important for MCQs, and short questions. It is the most difficult chapter that makes most of the student puzzled. You must have deep understanding of oxidation and reduction reactions at this level. Make use of Youtube where you will find many Urdu videos on this topic. This chapter is about chemical reactivity. Reactivity is the ability of an atom or molecule or even the radical to undergo a chemical reaction. That's why, this chapter is about the reactivity of metal and non-metal and much more. 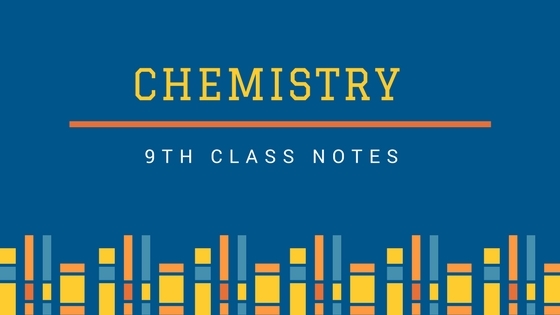 Here you can download in PDF or even view online the 9th Class Chemistry Notes with ALL CHAPTERS without going to another website.